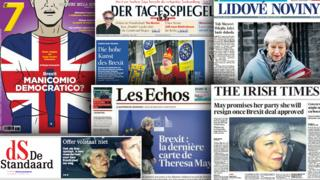 European newspapers say UK Prime Minister Theresa May's promise to quit if MPs back her Brexit deal - and the failure of Parliament to agree on any of the eight proposed alternatives - have plunged Britain deeper into paralysis.In Germany, Die Welt says "Mrs May plays her last card - her own job". It notes growing support for her proposed deal among MPs from her Conservative Party but says it remains doubtful that it will eventually be approved, adding: "The Brexit chaos in the British Parliament goes on." Similarly Germany's Bild speaks of the "chaos becoming even more confusing" after MPs rejected all eight alternative Brexit proposals. Der Spiegel magazine describes proceedings as "another day of chaos in Westminster". Brexit: What just happenedWill the DUP hold out on Brexit deal? France's Le Figaro observes that Mrs May made a "Faustian pact" with Conservative MPs by offering to resign, but adds "on the other side of the Channel, Europeans are watching these developments with a feeling of weariness". Meanwhile, Le Monde's headline says: "The prospect of a no-deal increases by another notch." It recalls that French President Emmanuel Macron and Belgian Prime Minister Charles Michel "openly evoked it as an option" at a European Council meeting earlier this month. For Polish broadsheet Rzeczpospolita, last night's Brexit wrangling was the "Final humiliation of Theresa May". "For a moment, it seemed that the never-ending Brexit saga was over. But this illusion lasted for two hours tops" it said, referring to the continuing refusal by the Northern Irish DUP party, on whose support the Conservatives rely, to back Mrs May's deal. In a similar vein, La Libre Belgique says the votes, "far from bringing the awaited clarity, plunged the United Kingdom into confusion even more profoundly". Looking ahead, Belgium's Le Soir points out that the UK may face a "cordon sanitaire" setting it apart from the rest of the EU in case of a lengthy exit process. "The hypothesis of a long delay to the UK's departure, for example for a year, will give the British an influence in the EU that the EU27 will do their best to limit," it notes. For Stephen Collins in the Irish Times, letting the UK hold another European election would be "disastrous" as the European Parliament already faces an upsurge of populist forces. "There is a serious danger that the Brexiteers who have paralysed the House of Commons and undermined the reputation of British politics will take their wrecking tactics to the European Parliament if the United Kingdom is allowed to remain in the European Union for an extended period," he says. "It is theoretically possible that European elections in the UK could provide a rallying point for those who want to remain in the EU or at least desire a softer Brexit… The problem is that no party apart from the Liberal Democrats is committed to remaining in the EU so the odds must be that, as last time, the elections will be a vehicle for anti-EU forces to mobilise." BBC Monitoring reports and analyses news from TV, radio, web and print media around the world. You can follow BBC Monitoring on Twitter and Facebook.